These are the show notes to an audio episode. If you want to listen online, please use the direct link below. http://traffic.libsyn.com/airspeed/AirspeedKranz.mp3. On Friday, 27 January 1967, a fire destroyed the command module of Apollo 1, taking the lives of Virgil I. “Gus” Grissom, Ed White, and Roger B. Chaffee. The subsequent investigation came up with, as is the case in almost any accident or incident, a cascade of causes. There are hundreds of thousands of pages of analysis, reports, and other documentary results of the investigation and subsequent changes at NASA and elsewhere. You can go read them at any of several depository libraries around the country. I’ve spent some time with some of those documents. But, as with any event of this kind, one or two concise statements eventually rise out of the stacks of paper that encapsulate the event and give us the real lessons. The lesson from Apollo 1 that most stuck with me follows. On the Monday after the fire, flight director Gene Kranz gathered his flight controllers and delivered the following. It has become known as The Kranz Dictum. Spaceflight will never tolerate carelessness, incapacity, and neglect. I don’t know what Thompson’s committee will find as the cause, but I know what I find. We are the cause! We were not ready! We did not do our job. We were rolling the dice, hoping that things would come together by launch day, when in our hearts we knew it would take a miracle. We were pushing the schedule and betting that the Cape would slip before we did. From this day forward, Flight Control will be known by two words: “Tough” and “Competent.” Tough means we are forever accountable for what we do or what we fail to do. We will never again compromise our responsibilities. Every time we walk into Mission Control we will know what we stand for. Competent means we will never take anything for granted. We will never be found short in our knowledge and in our skills. Mission Control will be perfect. When you leave this meeting today you will go to your office and the first thing you will do there is to write “Tough and Competent” on your blackboards. It will never be erased. Each day when you enter the room these words will remind you of the price paid by Grissom, White, and Chaffee. These words are the price of admission to the ranks of Mission Control. I don’t know how accurate that transcript is. And I’m not sure that I care. In any case, it’s a stern and accurate statement about how we should view what we do. In spaceflight, aviation, or anything else that balances the Big Dream with things in the absence of which everybody’d do it. I thought about airing this in January when NPR or other media occasionally mention the anniversary of the fire. But you’re getting it now. When it’s not on your mind. Because that’s when cascades of events like those of January 1967 happen. When it’s not on your mind. Apollo 11 landed on the moon just two and a half years later. It took a re-tooling of many aspects of the Apollo program, both mechanically and mentally. But we did it. And, when we finally sweep aside bureaucracy and things that don’t really matter, we’ll go again. And beyond. Let’s go and be adventurous and bold. Let’s do first solos. Let’s test-fly experimental aircraft. Let’s fly at low and slow with a notch of flaps looking downed aircraft. Let’s pull hard and abruptly (preferably over an official – or unofficial – show line). Let’s rattle dry lakebeds with sonic booms. And let us do so better, faster, longer, higher, and harder. We cannot eliminate all risk, but we can resolve every day to live by the Kranz Dictum in everything that we do. And let our courage to do these things find a true foundation in knowing that we have done things to a standard that would have received a knowing nod in mission control in 1969. Nothing really worth doing will ever tolerate carelessness, incapacity, and neglect. The Kranz Dictum gives us a standard by which to measure ourselves when we do things worth doing. Let us be aviators. Let us be spacemen. Let us explore. Let us be tough. Let us be competent. Photo: NASA. View of the Flight Directors console in the Mission Control Center (MCC), Houston, Texas, during the Gemini 5 flight. Seated at the console are Eugene F. Kranz (foreground) and Dr. Christopher C. Kraft Jr. (background). 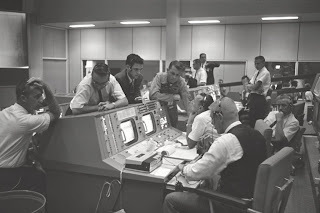 Standing in front of the console are Dr. Charles Berry (left), an unidentified man in the center and astronaut Elliot M. See. Available at http://tinyurl.com/yzbnfkg. Airspeed – VIDEO – CAP Glider Sorties from Steve Tupper on Vimeo. These are the show notes to a video episode. If you want to watch online, please use the direct link below. http://media.libsyn.com/media/airspeed/AirspeedCAPGlider.m4v. Here’s the video from my first two glider sorties. I went up during the Oakland County International Airport (KPTK; “Pontiac”) Open House 16 August 2009 with Mark Grant. 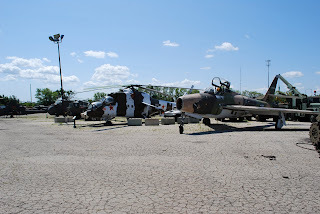 These were CAP sorties with CAP equipment both towing and towed. And we were in some pretty busy Class D airspace, as you can hear. Great experience. I need to get out and get some stick time as well. Maybe a project for next summer. BTW, I’m a CAP major and member of CAP’s Oakland Composite Squadron in southeast Michigan. That’s how I got access to these great rides. I also volunteered at the event, handing kids and adults into and out of the CAP aircraft. I put this footage up in and Airspeed episode because it was a great experience and because I promote CAP to anyone who’ll listen. But you should know that CAP doesn’t endorse or promote Airspeed. Fair enough? These are the show notes to an audio episode. If you want to listen online, please use the direct link below. http://media.libsyn.com/media/airspeed/AirspeedRussell.mp3. This spring, I got a call from listener Luke Donald from Russell, Illinois. 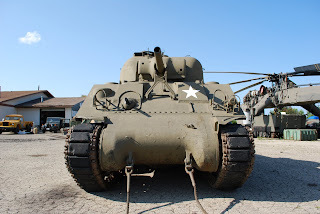 Luke volunteers at the Russell Military Museum and thought that the museum might be a good subject for the show. 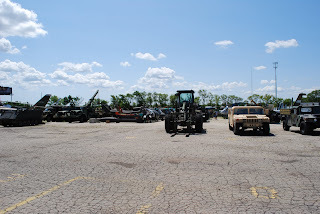 I took a look at the map and realized that Cole and I would be driving right by the museum on our way to Oshkosh, so I wrote Tim back and asked whether I might be able to stop by and interview someone in person. 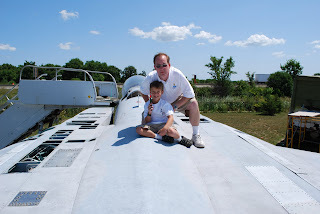 So, on the Wednesday of AirVenture Oshkosh, Cole and I departed from Airspeed Headquarters in southeast Michigan at about 5:00 a.m. and pulled into the parking lot in Russell at about noon Central Time. I met Luke and he walked me around the grounds, including having the chance to climb up and walk around on top of the newly-arrived F-15. I then interviewed Mark Sonday, the museum’s director. 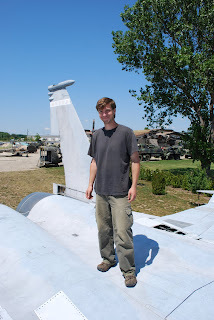 We had to get going to make it to Oshkosh and then Appleton for the Cessna Citation Mustang flight, but we stopped back in on our way back on Sunday to interview Luke and talk a little more about the museum and what it’s like to volunteer among these rows of military aircraft, vehicles, and other items. I’m going to run both interviews back to back here. These are the show notes to an audio episode. If you want to listen online, please use the direct link below. http://media.libsyn.com/media/airspeed/AirspeedDavisL-39.mp3. We’re very fortunate here in the Michigan Wing of Civil Air Patrol for a number of reasons. One of the best is LtCol Tim Brutsche, better known to some as “Dawg,” leader of the L-39 demonstration team, The Hoppers. Here’s why. 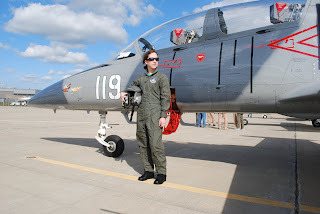 Tim offers a ride in his L-39 to any Michigan Wing cadet who completes CAP’s Spaatz Award. The General Carl A. Spaatz Award is the highest award in the Civil Air Patrol cadet program. Think Eagle Scout and then some. It’s awarded to cadets who successfully complete all phases of the CAP cadet program and a final checkout consisting of a comprehensive leadership and aerospace education written examination, a graded essay, and a physical fitness test. The Spaatz Award is arguably the most difficult honor to earn in the CAP cadet program. Substantially fewer than one in 1,000 CAP cadets ever earn the Spaatz award. C/LtCol Melanie Davis received her incentive ride at Battle Creek this summer during the lead-up to the Battle Creek Field of Flight Airshow and Balloon Festival. I was over at the Duncan Aviation ramp finishing up my own T-6 ride with the AeroShell Team at the time and managed to get over to Tim’s hangar to do the interview planeside with C/LtCol Davis. I should note that the L-39 incentive ride is not a feature of CAP or of the cadet program, either in Michigan or anywhere else. It’s something that Tim offers out of his own personal commitment to seeing young people thrive in the CAP program and it’s conducted completely separately from CAP. I should also mention that there’s no particular guaranty that the offer will last for any particular time or be made available in any particular way. It’s all up to Tim and anyone with questions should direct them to him. I think that this is a wonderful incentive. And I can’t think of a better program to which Tim might direct this particular kindness. If you haven’t yet considered joining and participating in CAP, you’re missing out! Hey, LtCol Brutsche! You can have my oak leaves and I’ll start at C/Amn if I can have a shot at time in that beautiful jet!